Calvert Cliffs Nuclear Power Plant | What Happens There? The Calvert Cliffs Power Plant is located in Lusby, Calvert County, Maryland and is the only Nuclear Power Plant in the whole state. It was built in 1974. The Plant has two 2737 megawatt thermal reactors that generate 850 killawatts electrical net. This generates power for a large portion of the Mid Atlantic region. The Plant is situated directly on the Chesapeake Bay. The cool waters of the bay are pumped into plant to cool the reactor units. The water that is circulating back into the bay is never more than 12 degrees Fereinheit warmer than the original water. This serves to protect the wildlife in the Chesapeake Bay, including our precious Blue Crabs! In February 2009, Calvert Cliffs Power Plant set a world record for pressurized water reactors by running 692 days non-stop. Also, Unit 2’s capacity factor in 2008 yet another world-record high of 101.37 percent. There is a standstill on the construction because the company that wants to build the reactor is located in France. The Board is currently denying permission to build because the company is not a United States based company. There were connections previously but they have since cut ties. There is a seismic risk at the plant. 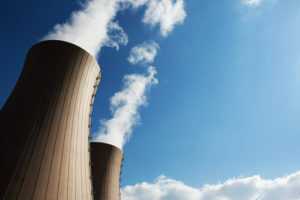 The Nuclear Regulatory Commission believes that the risk each year of an earthquake strong enough to cause core damage to the reactor at the plant was 1 in 100,000 for Unit 1 and 1 in 83,333 for Unit 2. There are evacuation procedures in place for unfortunate situations like this. Scientists became worried that the output of heated water from the plant would be harmful to a crucial element of the Chesapeake Bay ecosystem, the bay’s famous Blue Crab. But In the late 1960s, a law suit generated one of the most important environmental cases in American history, Calvert Cliffs Coordinating Committee, Inc. v. Atomic Energy Commission, causing the Nuclear Regulatory Commission to take into consideration the environmental repercussions such as an atomic energy plant. There has been talks of an early retirement for the Power Plant. What does the future hold for this Bohemoth? Only time … and Federal regulations… will tell! Check out our next blog on the top breweries in Southern Maryland!